Currying » Tagged "currying" » Rash thoughts about .NET, C#, F# and Dynamics NAV. 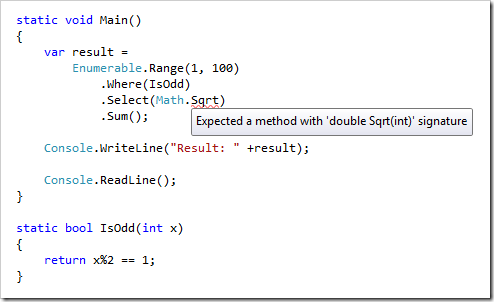 In this post I want to show you a way to simulate type classes in C# and F#. Type classes are this wonderful feature in Haskell which allow you to specify constraints on your polymorphic types. We donâ€™t have this in C# nor F#. The trick is that we pass the concrete implementation as the first parameter into our function. This works exactly like a type constraint or as Simon Peyton-Jones would say: the vtable travels into the function. Notice that we donâ€™t have access to the definition of in nor double. There is no way for us to express that int or double implement a number interface. As you can see, this is perfectly type safe. 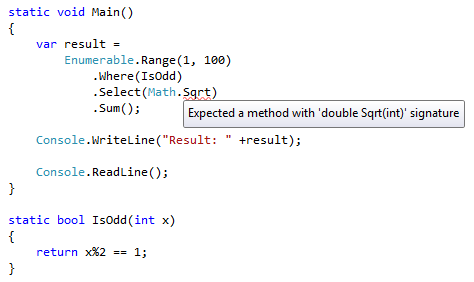 We now have a way for poor manâ€™s type classes in C#. Yay! We’re using a lot of partial application here. Exercise: Try to spot all the places. Ok, youâ€™re right. This post might be a little bit far away from the partial application stuff, but itâ€™s still related. Somehow. Letâ€™s look at the signature of the desired Curry-function: in our case it has to take Func<int, int, int> and returns Func<int, Func<int, int>>. You can find it at the top of the Prelude in FSharpx (read more). You can find it in the Haskell Prelude. You can find similar functions in Scalaz. My last blog post was yet another introduction to Currying and Partial application. Now I want to put the focus more on the why part. Why do we want to have our functions in curryied form most of the time? This is the first part of a small blog post series and shows partial application in F# pipelines. Using â€œFluent interfacesâ€ is a popular technique to write code in a more readable form. In languages like C# they also provide a way to create the code much faster. On every . 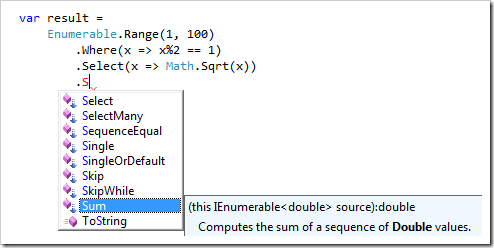 we get IntelliSense and this gives us a â€œfluidâ€ way of writing. Notice that float is a function from int to float and not a cast. Now you might ask: how does this all relate to partial application? The answer is simple: In every pipeline step we use a higher-order function (Seq. *) and apply the first parameter with a lambda. The second parameter is given via the |> operator from the line above. And when I need a function which triples its input? Same thing, just create another method. But can we do better? How cool is this? We just applied a single parameter and we got a new function without writing any method declarations. Unfortunately we wrote a lot of weird type declarations in order to get here, but hey.